On October 9, 2018, His Beatitude Sviatoslav at the Pontifical Synod in Vatican spoke about the need to nourish the prayer spirit among modern youth. 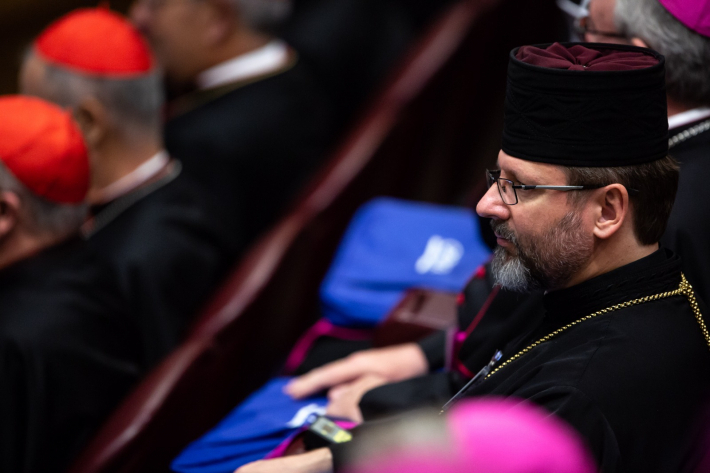 Addressing the Holy Father and the Synodal Fathers, the Head of the UGCC drew attention to the fact that the Church should teach the modern young people to pray. "I recall that some of the Synod Fathers spoke a few days ago about the need to pray for youth. I would like to add: you need to pray not only for the youth, but also with the youth. We see that this need is growing very much among young people. There is an ancient tradition in the eastern world: when a young man approaches the elder, first of all he asks him to teach him to pray," said His Beatitude Sviatoslav. He also told the participants of the Synod of a study that was held in all dioceses of the UGCC in Ukraine and the Diaspora. The purpose of this survey was to help the Church understand who, how and when teaches young people to pray. "We discovered an unexpected and quite disturbing reality for ourselves," said His Beatitude Sviatoslav. "Whole generations grew up who have never seen their parents pray. Some respondents answered that they participated in divine services, but never saw that the priest prayed himself or with them. Most young people responded that they learned to pray from their peers during pilgrimages. A significant part of the survey respondents said that today there are very few people who could teach them to pray." "That's why we asked our monasteries and Bishops to open their homes and create schools of prayer for youth," said the Head of the UGCC. He also thanked the ecumenical community of Taizé, "which becomes the world center for prayer for youth, which creates a whole culture of prayer. Thank you for organizing prayer days in L'viv (Ukraine), where you created the atmosphere of a common youth prayer for Catholics, Orthodox and Protestants." Participants of the Pontifical Synod responded to the speech of the Head of the UGCC with loud applause.